Toronto – July 8, 2013 – Frank D’Angelo’s first movie venture – Real Gangsters, a star filled mob film – received standing ovations and won the IC Savings Best Film Award for the contribution to the Canadian and Italian culture. "Of course, given all the wonderful films that participated in the festival, it was not an easy decision to pick only one for the IC Savings ICFF award,” said Fausto Gaudio CEO of IC Savings. Real Gangsters is a new-style, realistic mob film, starring: ROBERT LOGGIA (Academy Award & Emmy nominee; Scarface, Independence Day, Big); STEVEN BAUER (Golden Globe nominee; Scarface, Raising Cain); JOHN SAVAGE (The Deer Hunter, Hair); MARGOT KIDDER (Superman movies, The Amityville Horror); NICK MANCUSO (Under Siege, Ticket to Heaven); MICHAEL PARÉ (Eddie and the Cruisers, Streets of Fire); ROBERT MANGIARDI (Death of a President); JOHNNY WILLIAMS (Goodfellas), SEAN MC CANN(First Do No Harm, Affliction, Tommy Boy), ART HINDLE (Paradise Falls, ENG), and many other talented actors. This film also introduces FRANK D’ANGELO the actor, who not only created, wrote and directed the film, but also wrote the soundtrack and performs most of the music in the film. The movie has now played to sold out audiences and received standing ovations at the Hoboken Film Festival in New Jersey and the Italian Contemporary Italian Film Festival in Toronto. 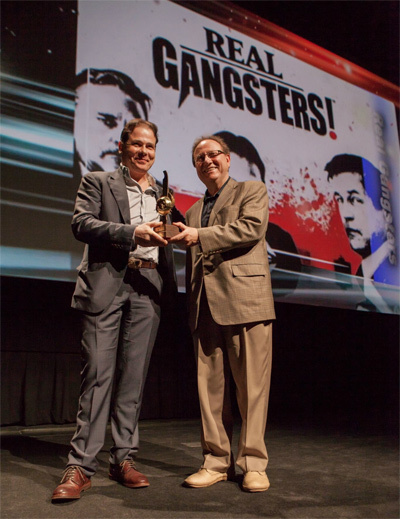 “With the crowds that the film has drawn, Real Gangsters has definitely been an audience favourite during this year’s ICFF film festival,” said Cristiano de Florentiis, co–founder of the ICFF. Real Gangsters tells the story of the Lo Giacamo family, one of the most successful crime syndicates in New York City. Run by cousins Vincent and Jack Lo Giacamo, Real Gangsters shows how these two men maintain control of their dangerous extended family and volatile business ventures by very different means. Vincent is the politician, the man who always has a plan to help keep the peace, find common ground, and bind blood and commerce to grow the family into a billion dollar empire. Jack is the muscle: the hot head who is ruthless and uncompromising living in the moment and acting based on how he feels. Unfortunately for these two men, these two philosophies don't always work together. Real Gangsters will be featured at many international film festivals this year including Action On Film Festival in Pasadena, California on Saturday August 17, 2013 at the Krikorian Theaters (410 S. Myrtle Ave. Monrovia CA 91016) at 8:00 pm.